New Lotus boss Gales wants to make the Exige (shown), Elise and Evora faster and lighter. 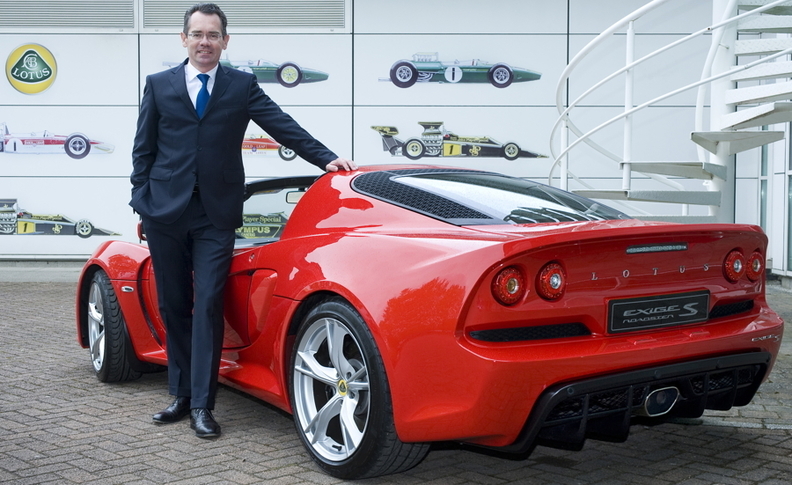 LONDON -- New Lotus CEO Jean-Marc Gales says he's "confident" he can make the money-losing brand profitable again by cutting jobs, adding dealers and boosting the sports car maker's lineup. New models coming "in the next two years" will continue to use Lotus' bonded aluminum chassis, Gales told Automotive News Europe. The lightweight tub-shaped structure has been the foundation of the automaker's agile cars since the first Elise was launched in 1996. Gales also wants to make the current three-car lineup – the Elise, Exige and Evora – faster and lighter. "The current range has still got a lot of life left," he said, adding that Lotus' brand values of driving enjoyment and fuel efficiency via lightweight construction doesn't restrict the company to just making sports cars. “These values can be attached to any segment you can imagine,” he said without elaborating on what other type of models Lotus is considering. Lotus posted a 159 million pound loss in the financial year that ended March 31, 2013, following a loss of 115 million pounds the previous fiscal year. Lotus declined to provide more recent financial data, and Gales declined to say when Lotus would be profitable again. To get back into the black, the company, owned by Malaysian industrial group DRB-Hicom, announced last week it would cut up to 325 people from its 1,215-person global staff. “It was a big decision and we deeply regret that we have to do it. But it's about securing the future of Lotus,” Gales said in the phone interview on Sept. 19. Since he arrived, Gales has “completely restructured” the 62-year-old company, which is based in Norfolk, eastern England, to keep a tighter control on costs and development time frames. The changes are starting to take hold. Lotus' global vehicle sales have increased 46 percent to 914 cars from April, the start of its new fiscal year, through August. Last year Lotus sold 1,232 cars worldwide. In Europe, Lotus’ sale were up 21 percent to 450 cars through August, according to figures from JATO Dynamics. Gales, however, believes those sales numbers would be even higher if Lotus had a larger dealer network. Gales will add up to 20 new dealers this financial year, and the automaker already has opened nine store within the last six months, including one in the Philippines and one in Iran. Gales has also hired former Kia Europe sales and marketing boss Jean-Charles Lievens to develop the automaker's sales network in France, Italy, Spain and Portugal. In 2005 Lievens was named an Automotive News Europe Eurostar for his work in restructuring Kia's dealer network, a move that helped boost the automaker's European sales. “This clearly excludes the five former concepts that we showed four years ago,” at the 2010 Paris auto show, Gales said. Gales, 52, joined Lotus from European supplier organization CLEPA, where he was CEO. Before that he was head of brands at PSA/Peugeot-Citroen and prior to that he was global sales director at Mercedes-Benz. He also has held executive positions with BMW, Volkswagen, Opel and Saab.